I am a huge fan of tyres that hit their design goals perfectly, and the Maxxis Ikon is such a tyre. 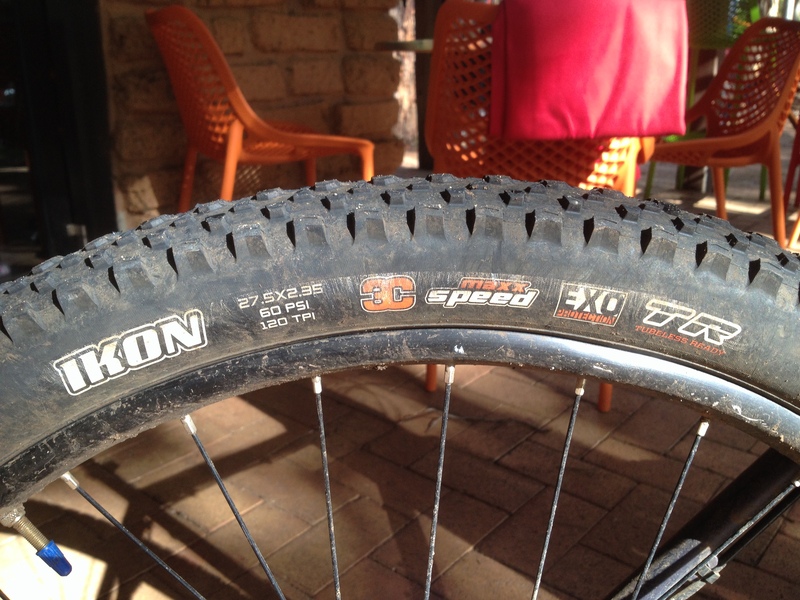 This tyre is available in both 2.2” (exceptional rolling speed and versatility, we use these tyres on our hardtail hire fleet at The Hairy Marron) and 2.35” (tested here) in all wheel sizes and multiple compounds and bead types to suit your budget and application. The Ikon is extremely fast rolling, and it excels on long rides over mixed terrain. Despite appearances this tyre constantly surprises me with the level of grip on offer in all but the loosest or sloppiest conditions. Thanks to the uniformly spread low tread blocks the Ikon is very predictable, inspiring confidence to lean the bike over in turns, with no vague feeling at any point in the lean. I have run the Ikon front and rear, and I find, with good technique, I feel confident in the grip even on flat, dry gravel corners. Since the tyre’s strengths are so clearly defined it is easy to recognise its limitations, and therefore to adjust your riding style to allow you to ride the Ikon comfortably in almost all conditions. Now the weather has turned I prefer a slightly more aggressive front tyre for hitting the mountain bike tracks at full pace, but when heading off for the day with no particular destination in mind, or for overnight rides the Ikon at both ends is perfect. The 2.35” version in particular has huge volume (ballooning up to 2.5” on wider rims! ), and the round profile fits many internal rim widths (I have used it on both 25mm internal and 35mm internal, and it has a nice profile with tread width wider than or equal to the casing width on both rims) and is therefore an excellent choice for rides during which you might encounter sand or other surfaces that require added floatation or the comfort of increased volume without the need to opt for a true plus or fat tyre. Paul and Andy are also fans of this tyre. Like me, Andy is really enjoying the versatility of the Ikon on the front and rear of his commuting/bikepacking bike which sees a mixture of easy singletrack and paved rides. Paul has been testing the limits of the Ikon on the rear of his singletrack attack steel hardtail, and is yet to want for more grip, even as the trails turn from dry and fast to grippy with patches of slippy. As I mentioned, I like tyres that fill a niche perfectly, and I find the Ikon is on par with classic Maxxis tyres such as the High Roller II and Minion DHRII (reviews to follow) in achieving its design goals. Although marketed as an all out cross country race tyre, I find the Ikon to be far more versatile than expected for everyday riding, encouraging me to take the road less travelled when exploring on my bike.